The Fault in Our Stars meets Eleanor and Park in this exhilarating and heart-wrenching love story about a girl who learns to live from a boy who intends to die. Soon to be a major motion picture starring Elle Fanning! Theodore Finch is fascinated by death, and he constantly thinks of ways he might kill himself. But each time, something good, no matter how small, stops him. Violet Markey lives for the future, counting the days until graduation, when she can escape her Indiana town and her aching grief in the wake of her sister’s recent death. When Finch and Violet meet on the ledge of the bell tower at school, it’s unclear who saves whom. And when they pair up on a project to discover the “natural wonders” of their state, both Finch and Violet make more important discoveries: It’s only with Violet that Finch can be himself—a weird, funny, live-out-loud guy who’s not such a freak after all. And it’s only with Finch that Violet can forget to count away the days and start living them. But as Violet’s world grows, Finch’s begins to shrink. This is an intense, gripping novel perfect for fans of Jay Asher, Rainbow Rowell, John Green, Gayle Forman, and Jenny Downham from a talented new voice in YA, Jennifer Niven. Arna recommends this as an all out good book for Year 9 and older. Initial Impressions 1/9/15: 4.5 stars -- Well it took me a little bit to get into and I was really afraid I wasn't going to love it but oh. My heart. This book. It was really, really great and just when I felt like I didn't know how the book could keep going, it kept pulling me through. So many things happened in this book. I laughed. I cried. I ugly cried. I was happy. I was shocked. And after reading Jennifer Nevin's notes afterwards and her acknowledgements. GAH. I ended up falling in love with these characters and this whole book and I just loved it. Full Review posted HERE on The Book Addict's Guide on 2/9/15: If there’s anything you need to know about All the Bright Places, it’s that it’s a book that will stick with you long after you’ve finished reading. I actually didn’t get around to writing my review until about a month after I finished reading and yet all of the emotions I felt as I was reading quickly came flooding back to me once I began to reflect on the book once more. 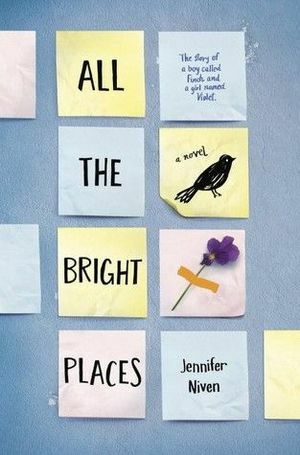 The tagline for ALL THE BRIGHT PLACES describes it as a mashup of The Fault in Our Stars and Eleanor & Park and while I see elements of both and feel like it’s a lot to compare a new release to these two giant names in contemporary, I feel like those comparisons really don’t do the book justice. I can spot where the pieces of these two books that could have drawn up these comparisons but ALL THE BRIGHT PLACES is a book that easily makes a name for itself and stands on its own two feet, offering a unique and emotionally-charged story that reaches out to a wide audience. When the book first opens, we’re presented with two characters: Violet Markey and Theodore Finch. What do they have in common? They’re both on the brink of suicide… and yet their stories are both very different. Immediately was invested but it actually took just a little bit for me to get into the book because I wasn’t quite sure where it was going — but that was a good thing. ALL THE BRIGHT PLACES wasn’t predictable, or at least it wasn’t for me. Violet seemed to be suffering for a depression after the loss of her sister about a year prior but Finch… he had a bit of a different situation going on. He describes his struggle in unique way that I didn’t quite understand at first, saying he goes from periods of being asleep and struggles to find the periods where he can feel awake. This causes him to miss weeks of school, to seem like an oddball to his peers so what does he do? He shrugs it off. Plays into the “weirdo” comments of his classmates. Tries on new personalities. Finch is so unique and so wonderful and I got to know this charismatic guy who was really struggling with something in his life and didn’t know how or why he was feeling the way he was and couldn’t surface long enough to do anything about it. I don’t want to retell the whole story because it’s a really wonderful experience that I want readers to have for themselves, but I will tell you that I absolutely fell in love with these two main characters and how they ended up forming a bond with each other. Violet and Finch were two kids who may have never come together without going through these incredible struggles in their lives and how they end up working through things with each other just really warmed my heart and soul. That being said, the book isn’t without a dark side. Both Violet and Finch have their own personal demons and it’s no common sadness. They both have serious issues to work through on many levels and although it’s hard to watch them experience, it’s such an incredible story to witness. I absolutely love what they discover about themselves through their friendship and experiences. They learn how to open up to each other and to the world. They learn how to laugh again, how to let go, how to speak, how to enjoy each day. I just really loved both of them so much and they ended up feeling like real people to me. This wasn’t just the story of Violet and Finch, but every person — young and old — who has been in their shoes. ALL THE BRIGHT PLACES was a home run for me. I was an emotional wreck after this book, having experienced some real highs and some true lows. I laughed, I cried (so hard), and I loved. This book has stuck with me since I finished reading and I know it will stick with me for a long time. It already holds a special place in my heart and truly the emotions come flooding back to me just thinking about the book or hearing the title. It’s one I truly recommend for so, so many reasons and I can’t stress enough the importance of what you’ll learn from these two characters. I really wanted to love this book having read so many wonderful reviews about it but, alas, it didn't do it for me. The first half of the book was great. I loved the front cover and the post-it note motif throughout. I also enjoyed the dual narrative, especially Finch's voice with his quirky personality and weird obsessions, and the way he tried to help Violet overcome her grief. However, he was also flawed and broken. I hated that he didn't have a strong support group and it saddened me how he finally decided to solve his problems. In comparison, I found Violet a weaker character who never really appealed to me although I did feel sorry for her near the end. This is not a happy, feel-good story as it deals with some heavy issues including teenage suicide and mental illness, but I can see it being very popular with teenage fans of "The Fault in our Stars" especially as a movie is already in the making.